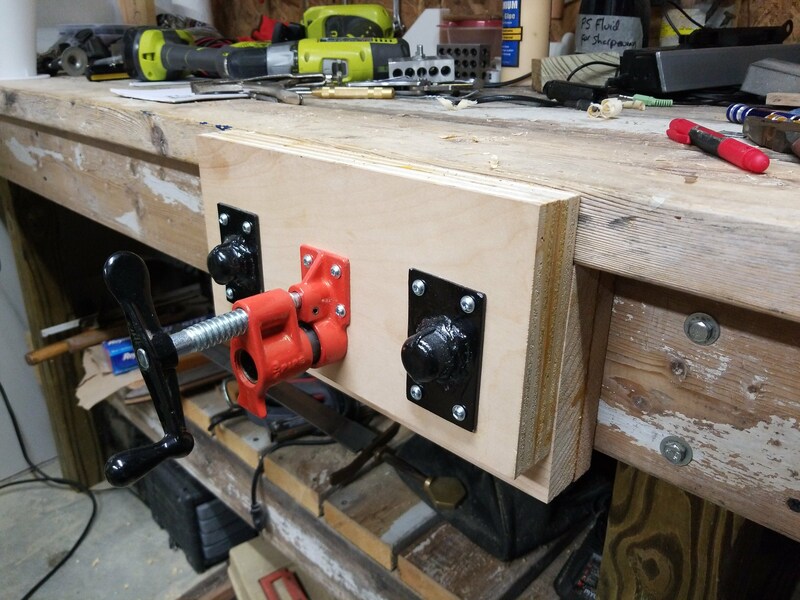 I built this workbench in 2013 and the one thing it’s always been lacking was a vise. 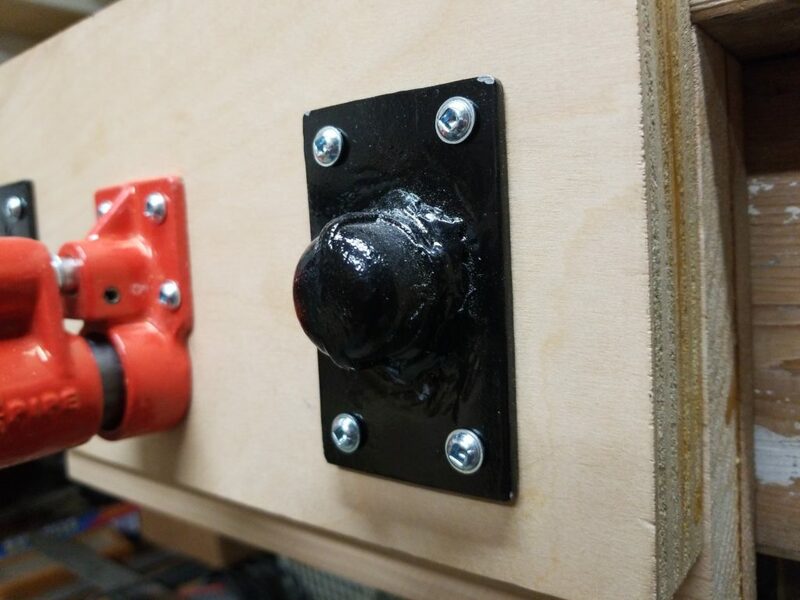 It’s never had a vise of any kind attached… and I decided to change that. I do more woodworking than anything, so I didn’t want a big metalworking vise. I wanted something flush with the top that could hold workpieces securely. Simple. Now, a search around YouTube will find loads of homemade vise ideas. Many of them, like the John Heinz vise (which is great BTW) are way more complicated than what I need… but, a few years ago I ran into this video by Jay Bates. This was the first pipe-clamp vise I had seen and I thought it was brilliant! The only problem was it’s size. My shop is a narrow one-car garage and a 3 foot vice with two handles sticking out really cut into my usable space. I know it doesn’t sound like much, but it is! This bench is only a bit over 6 foot long and it’s up against a wall. Taking up half of it for a vise just wasn’t an option. 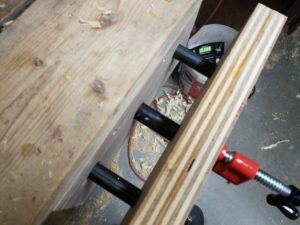 So, I started dreaming up ideas for how I could do a single clamp vise. I had what I thought was a unique idea for the two side rails, then ran into this John Heinz video series. He had a problem I didn’t think of using pipe flanges. So, I shelved the idea for a while. I’ve only recently got the welder out and running, and suddenly I had a solution for attaching the runners. So, here’s the video. I did a pretty terrible job welding those caps. I overheated the base metal and warped it pretty bad… about 3/16″ over the width of the plate. I cleaned up the welds and painted them at the advice of old Uncle Bumblef@#k.
The bad welding meant that when I screwed the plates down, the pipes splayed out at an extreme amount. This means that sliding it in the bench was not nearly as easy as I made it look in the video. I had to bore out the holes in the bench quite a bit to make it move smoothly, but even so, there’s very little play. One detail that didn’t quite make sense in the edit, but I left it in anyways, was these two boards I laminated together for the back jaw. When I built this bench, I wasn’t really thinking about how I would use it in the future, so I just made the top hang over an indeterminate distance that I thought would be convenient for clamping. This meant that I needed to space that back jaw to some weird size that was larger than 2-by material, but not by some normal dimension. So, I laminated on a 1-by and then ran the sandwich through my planer until it was perfect. It’s just ever so slightly behind the front edge of the bench, meaning that the bench top itself is the clamping surface. I was going to try and notch the front lip of the bench and put a plywood back jaw on, but I think the front of the bench will work just fine. We’ll see over time. Drilling holes in the pipe clamp was surprisingly easy. This particular clamp is sold by Harbor Freight for $10, so I wasn’t expecting hardened steel… but I would say it cut easier than mild steel. I attached everything with fine-thread, cap head screws and to my surprise, it works great! 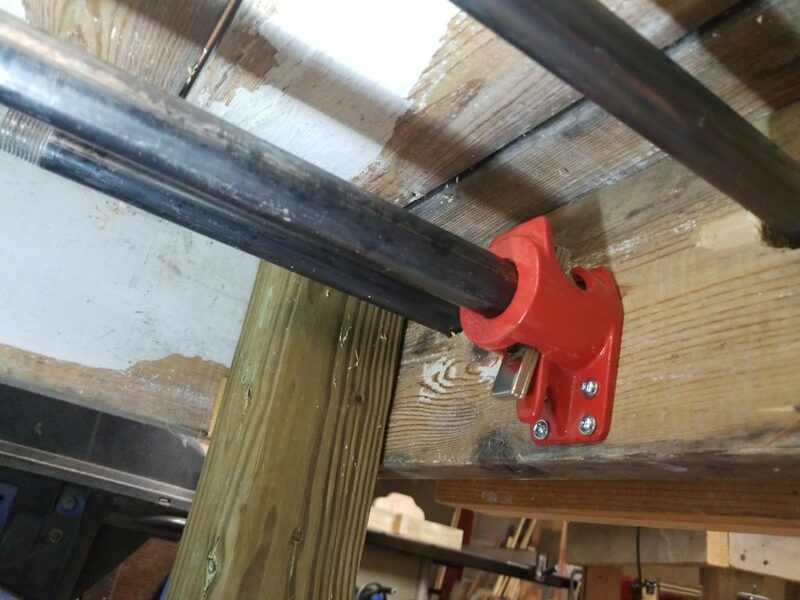 You just need to reach under the bench a bit to hit the quick release and the vise slides freely. I will be making a push-button type release on the front of the bench soon. I’ll be sure to update the article when I do. For now, however, it’s very easy to actuate. Overall, I’m really please with this little addition to my bench. If I had one thing to change, it would probably be the whole thing. I’d have just bought a vise. I had this stuff lying around, so it was worth it to me, but for $30 on Amazon you can get a pretty nice 6″ woodworking vise and be done. It won’t be a quick-release vise, but it also won’t take you a few days to mount it. 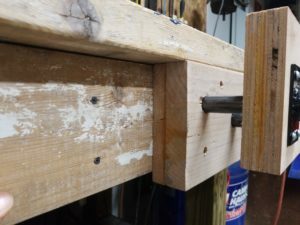 My homemade vise would cost me about $40 if I had to buy this stuff new, and it also required quite a few tools a budget woodworker doesn’t have… so yeah. I enjoyed the project, but it wasn’t really financially worth it. Spiritually though, it was a nice achievement. Thanks for stopping by and checking out the article. If you aren’t already subscribed to me on YouTube, I’d love it if you’d join me there. I post daily conversations and the occasional project like this one. Stop by and chat. I’d love to have you!